The charm has been there since Day One (so I’ve read; I’m not that old). And the change? Well, that term has probably been attached to the Village since Day Two. “Do you remember that old daytime (TV) show ‘As the World Turns?’ I want to call it, ‘As the Village Turns,’ says Scott Davis, owner of Davis Cookware and Coffee, chuckling about all the changes he’s seen in 50 years of working in Hillsboro Village. “There’s always some drama. And there’s always what I call perspective. There’s a lot of perspective these days – and change. Good or bad? Depends on who you ask. Hillsboro Village has always been a haven for local ownership, but that has been changing as national companies and brands continue to invest in Nashville. “The biggest question as we go through this transition is can we continue to be a place that’s a home for local businesses because that’s part of what created the charm and the atmosphere, and it’s important to maintain that if we can,’’ says District 18 Councilwoman Burkley Allen, who represents the West End area from Vanderbilt University to Belmont all the way to I-440. Pangaea, a popular clothing, jewelry and home décor shop, is the Village’s latest local closure, shutting to the public for good this past Sunday after 31 years as one of the hamlet mainstays. 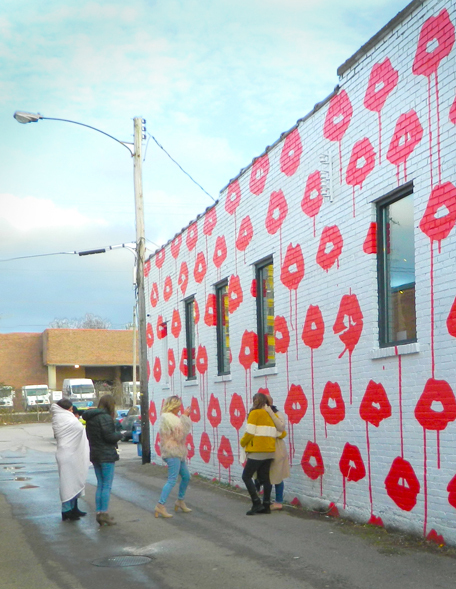 A group of young women braves the cold to photograph themselves before the lip-covered wall on the side of the UAL Clothing store in Hillsboro Village. Other well-liked businesses to cease operations over the past few years include Bosco’s (2014), Sunset Grill (2014) BookMan/BookWoman (2016), Jackson’s Bar & Bistro (2018) and Provence Bread & Cafe (2018). “It’s the nature of retailers to evolve, and there’s some businesses that work out and some don’t, and there tends to be a life cycle to them,” explains Randy Rayburn, who operated Sunset Grill for 24 years in the Belcourt Avenue spot now occupied by Biscuit Love. Indeed, for every shutdown there is a new business venture ready to take its place. Nashvillians are famously respectful of the privacy of its celebrities and sports figures, and that’s why you’re likely to spot one shopping or dining in Hillsboro Village on any given day. The Pancake Pantry is especially popular, and no doubt many a country music song or deal has been hammered out over pancakes and eggs. Posh Boutique is notably frequented, as well. Among the celebrities spotted in the Village over the past few years are Vince Gill, Derek Mason, Nicole Kidman and Keith Urban, Kelsea Ballerini, Tim McGraw and Faith Hill as well as Hollywood types such as actors Charles Esten, Liam Hemsworth, Ryan Reynolds and Blake Lively and Mike Love of the Beach Boys. Kidman recently hosted a star-studded local debut of her latest film, “Destroyer,’’ at the Belcourt Theatre, including a question-and-answer session following the movie. Want to see A-list celebrities in Nashville? Hang out at Posh boutique or across the street at Pancake Pantry or Fido. The Village dates back to the early 1920s, catering to the universities and Nashville’s wealthy. Davis says it was called the “silk-stocking” district, and was the first business area outside downtown Nashville. “Hillsboro Village has been the model of how Nashville’s great neighborhoods have evolved and grown over the past several years. Hillsboro Village has been serving as a real neighborhood hub since 1925 when Belcourt Theatre was built, since many of these businesses opened their doors,” adds Stephanie Silverman, executive director of the nonprofit movie house. Saralee Terry Woods, owner BookMan/BookWoman book reviewers, sees a bright future ahead for Hillsboro Village. “We have total confidence in businesses like Fido, Hey Rooster and The Pancake Pantry. 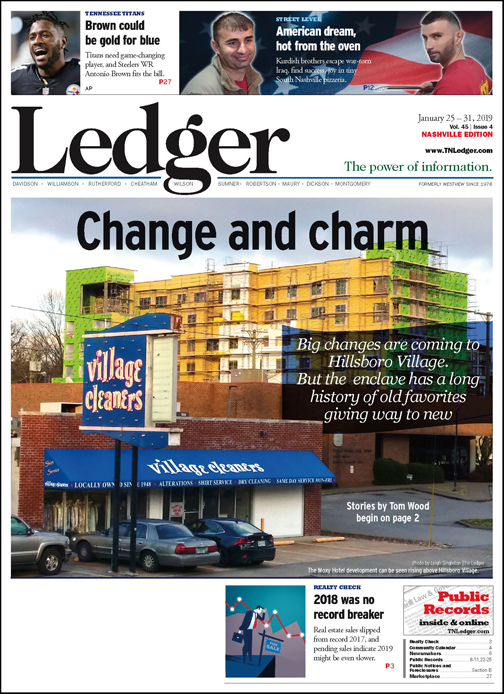 Hillsboro Village will continue to benefit as the shopping area for two large and growing universities, a hospital complex community and thousands of tourists,” Woods points out. A couple of years ago, Courtney Webb moved Hey Rooster General Store from East Nashville into the space previously occupied by BookMan/BookWoman. “It was the day that the Chinese New Year parade goes through the Village, and it was the first day of the Year of the Rooster, and that was the day I signed my lease. So it was a good symbol and welcome to the Village,” Webb recalls. A perfect example of this is at Davis Cookware and Coffee. Davis says his first Hillsboro Village job was washing dishes at a drugstore lunch counter sometime around 1968. “The Village has always been a place for entrepreneurs and a place to go with a completely new idea. 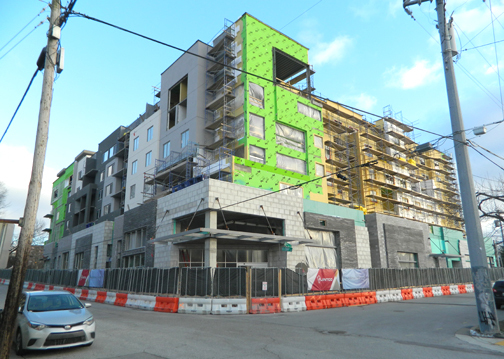 The $37M Moxy Nashville Vanderbilt takes shape on 20th Avenue South. The influx of new businesses, Davis adds, has meant adapting his store to meet the challenges. So he’s focusing more on the coffee and less on the cookware. “And so now our tourism is so high – that’s the newest thing – I would argue that half the people coming in my store will never come back in my store,” Davis acknowledges. “They’re coming in from out of town, which is great, but we’re having to change our market and change our thoughts about what we’re going to try to sell that person because they’re not going to buy a $100 skillet and go home. “The $100 skillet person doesn’t want to come down here because they can’t find a place to park and they’ve got to put quarters in a meter, and they’re less likely to come here than go to the mall. So it’s not a negative statement, it’s just a reality. “So some of us old dinosaurs are realizing we have to sell $5 and $10 items to put in the purse of a tourist to make up for the $100 skillet sale. The staff has to be different. The interior has to be different. Everything has to be different. “We’re trying to (evolve). We’ve been selling coffee and tea by the pound for 42 years. Now we sell coffee by the cup. People come in and get an espresso, a cappuccino, so we’re promoting that. Its first boutique hotel, the six-story, $37 million Moxy Nashville Vanderbilt, which is expected to open in late spring with 130 rooms. It will also include 7,000 square feet of retail space, 47 apartments (all but five are one-bedroom, renting from $1,200-$2,000) and a 200-car parking garage. “(The Moxy) adds to the vibrancy of Hillsboro Village that’s been there a number of decades and will certainly provide additional amenities and also an anchor to the things that make the Village unique,” explains Summit Management founder and owner Greg Averbuch, who moved to Nashville two and a-half years ago. Averbuch is developing the Marriott International brand Moxy with Rayburn and real estate developer John W. Nelly Jr. The Moxy was designed by architect Manuel Zeitlin, who spent 15 years in Hillsboro Village before moving his offices to the Houston Chestnut area, and Bounds and Gillespie Architects of Memphis. “What’s happening is there’s a whole lot more residential/multi-family apartments, the hotel we designed, being built in the Village, so I think on a real positive note, the Village is going to become a round-the-clock neighborhood,” Zeitlin offers. Belcourt Village, a mixed-used project across from Belcourt Theatre with retail and office space, 28 studio, one- and two-bedroom apartments and a 215-space parking garage that is expected to open in May with the remainder of the project opening later in 2019. Tommy McDougal, owner of McDougal’s Chicken, says he is excited about his new Belcourt Village neighbors. “That will be helpful; it’s two feet from my building,” McDougal says. E3 Chophouse, an upscale steakhouse owned by former professional baseball players, Jeff, Adam and Andy LaRoche. Peacock Jewelers will serve as home to Village Jewelers, Nashville Chocolate Truffles and Nut Co., and other brands both local and national. “It’s a custom boutique, but our main thing is jewelry,” Peacock owner Joey Nunley explains. “Our concept is a little unique. If you think about when you go to a Taco Bell, and the Taco Bell is owned by Pepsi-Cola, has their Pizza Hut under one roof. Catering to all tastes and customers has been a Hillsboro Village hallmark for decades. Finally, one can’t talk about Hillsboro Village without a discussion of traffic congestion and a lack of parking. The traffic issues are still being discussed, but the Moxy and Belcourt Village parking garages should help. Also, the former location of Jackson’s is now a parking lot. Another positive is the 21st Ave. crosswalk located at Belcourt Avenue, which can be activated by pedestrians. “It’s crazy. 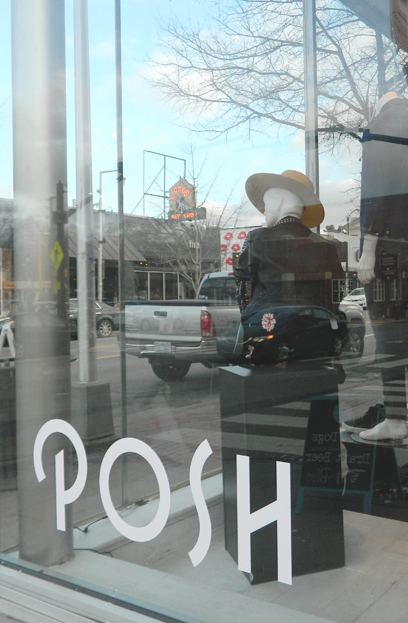 I’ve only been here seven months, and they’ve put in that pedestrian walkway, which has made a huge difference,” says Madison Gourley, manager of Posh Boutique. “I heard they tried to get it approved for a long, long time, so it just goes to show how many people are visiting here, that it got approved.